The retail apocalypse is suburban. Cities will weather this concentrated economic downturn because they went through it 50 years ago. Their neighbors may not be so lucky. 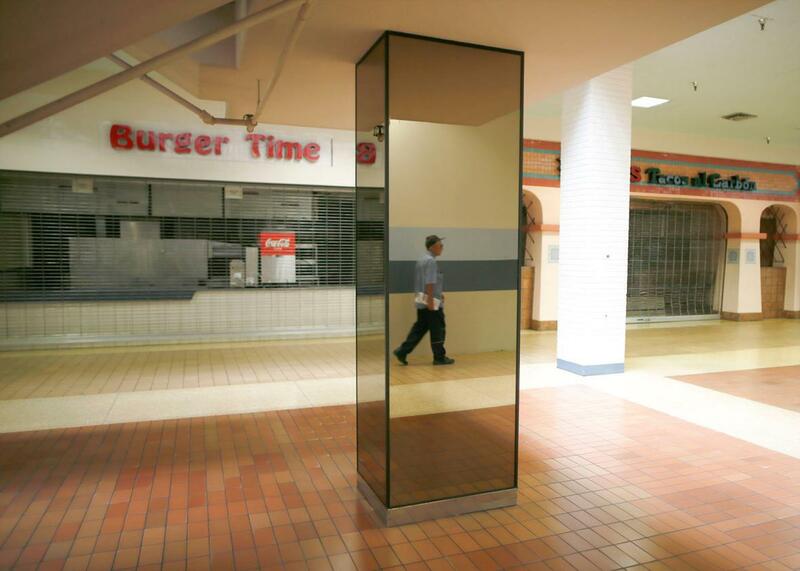 A man walks past empty stores in the deserted Carousel shopping mall in San Bernardino, California, Sept. 11, 2012. One by one, the problems that America has long dismissed as “urban” have marched into the suburbs: crime, poverty, hunger, deindustrialization, drug addiction, civil unrest. The dissolution of community institutions. An aging stock of unwanted houses. To which we can add: the decline of retail. It has been a decade since the media declared the death of the mall, in a year that would be the first in a half-century that no new malls were built in America. It has since become apparent that the problem is a little bigger than that: Brick-and-mortar retail in general is gasping for breath. The Limited, a women’s clothing store, shut down 250 stores and laid off 4,000 workers earlier this year. Sears Holdings will close 150 stores, including 108 Kmarts, and Macy’s will close another 100. As anchor stores close, more and more malls are entering foreclosure. Financial instruments composed of debt from mall deals are looking as risky as their counterparts in residential debt did before the housing crisis. Several months of job losses in certain retail categories—at a time when the economy is otherwise healthy—have sounded the alarm for the transition that economists have long feared from the rise of e-commerce in general and Amazon in particular. Technological change spurred by new infrastructure and some favorable tax policies have radically changed the way Americans shop, and communities built around old-style shopping will find themselves saddled with obsolete structures. That sounds like news. But it’s exactly the way you could describe the decline of urban retail that seized the American downtown in the second half of the 20th century and never let go. To some extent, cities are well-positioned to weather the current shift, since the jobs that look vulnerable right now left for the suburbs years ago. And maybe suburbs, where the current wave of job loss will be concentrated, could learn something from how cities managed (or failed to manage) that decline. In the post-war era, as cities battled population flight and a declining tax base, city planners came to see downtown commerce as an essential component of the urban revival. Department-store magnates had long played a major civic role, sponsoring parades and directing local policy, and they made their preferences—like plentiful off-street parking, slum clearance, improvements in highways and transit, and modern shopping centers—those of the city. It didn’t work. Suburban shopping centers maintained essential advantages. The tax burden in brand-new, well-off suburbs was low. Federal policy gave better write-offs to new construction than renovation. In a misguided attempt to revive downtown retail, city planners demolished the blocks of family-owned businesses that had anchored it. The memory of a downtown department store became a generational marking point. It was the beginning of a fight over the geography of retail that has never ended. Cities sued suburbs over new malls; suburbs battled each other with offers of prime land and tax breaks. In the 1980s, New Haven, Connecticut—desperate to stop the construction of a 1.1 million square foot mall in the suburb of North Haven—filed four lawsuits over highway widening and wetlands protection, among other subjects. The battle went on for most of the decade, and the mall was never built. Then, in 1999, the city tried to build a 1.5 million–square-foot mall but ran into opposition funded by the company Westfield, which operated malls in three nearby suburbs. The retail sectors in which recent job loss is concentrated belong largely to American suburbs. Seventy-one percent of workers in sales and related occupations live in the suburbs, according to the Brookings Institution, about 2 percentage points higher than the average for U.S. workers. Leading the pack are department stores; general merchandise stores; and sporting goods, hobby, book, and music stores. Each of those categories has lost jobs for five straight months, dating to November. Clothing stores, after experiencing a big holiday spike, have lost jobs for two straight months. In other words, it’s exactly the industries you’d expect to be hit hard by the rise in e-commerce, and as the Houston Chronicle’s Lydia DePillis succinctly shows, a much larger, longer trend is in skyrocketing warehouse employment. (How those jobs compare to traditional retail jobs in quantity and quality is a question for another day.) Retail sectors with less developed online analogues—like grocery stores, gas stations, and car dealers—are chugging along just fine. Urban commercial corridors have a few advantages here. First, while the blight of a vacant storefront can be contagious and damaging, the ownership structure of an urban corridor is more forgiving than that of a mall, where a few vacancies could tip the balance sheet of the whole entity into the red. Second, the typical mix of an urban retail corridor—with stores flanked by restaurants, bars, and other entertainment attractions—ought to be more resilient than old-fashioned malls. Indeed, posh, successful “town center” malls have learned from developments like Baltimore’s Harborplace and strive to differentiate themselves. The Grove, in Los Angeles, one of the world’s most successful malls, has a literal trolley running down its main “street.” Third, mixed-use and transit-oriented development keeps people (including tourists) in close contact with retail. What stands out from the last time all this happened is this: Major American cities threw everything at retaining center-city retail, and they still basically failed. Holes left by declining sales and property-tax revenues will make suburban jurisdictions desperate for new development, and they—like cities before them—will make bad decisions in an effort to revive their retail centers, which now carry much the same civic symbolism, and inspire the same strong memories, as downtown retail did for cities. And if there’s a lesson from the cities, it’s that the broader systems changing how people shop cannot be overturned with tax breaks for new developments. The sooner they begin to think of alternate ways to create community and jobs—and to reuse and rebuild the vacated space of the mall—the better off they’ll be.